This book is a wonder. Not a recipe book per se, though there are great recipes included--it is a celebration of pie, all kinds of pie. Kate is a poet, a damn fine poet, and it shows in her writing. The illustrations by Jessica Lynn Bonin are a delight as well. If you ever get to Edison check out her store/gallery, The Lucky Dumpster. This book is the perfect gift for anyone who loves pie. And who doesn't? 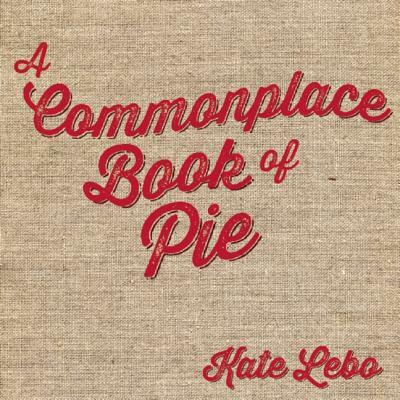 In this debut collection, award-winning poet and baker Kate Lebo redefines everything we thought we knew about pie. An eclectic mix of prose poems, fantasy zodiac, and humor, "A Commonplace Book of Pie" explores the tension between the container and the contained while considering the real and imagined relationships between pie and those who love it. Expanding on Lebo's successful chapbook of the same name, this volume includes new poems as well as more than two dozen Americana-themed illustrations by artist Jessica Lynn Bonin. Bonin's art adds a sense of nostalgia alongside Lebo's modern style, and together with the text, puts pie and the art of baking in a fresh, contemporary context. Kate Lebo makes poems and pies in Seattle. Her writing has appeared in "Best New Poets," "Gastronomica," and "Poetry Northwest." When Kate is not creating poems, she is hosting her semi-secret pie social, Pie Stand, around the US, teaching creative writing at the University of Washington and Richard Hugo House, and pie-making at Pie School, her cliche-busting pastry academy. Jessica Lynn Bonin is an illustrator and mixed-media artist whose work adds a modern twist to familiar images of American culture. Bonin's murals are displayed in New York, Oregon and Washington state. She lives and works in a former hardware store and lumberyard in Edison, Washington. "How is a banana like a push-up bra? What's the best way to thicken a berry filling? This book is the answer to the prayers of pie-lovers everywhere. Both whimsical and practical, it will charm your pants off -- and your apron on. I'm giving it to all my friends!" -- Kim Addonizio, author of "Ordinary Genius"